Delhi’s heritage water bodies are nothing but stagnant pools of filth. Can their revival help resolve the water crisis? The air is cool and humid. Early morning drizzle has weakened the scorching June sun. Amidst the lush greens of the Mehrauli Archaeological Park, the 16th century stepwell called Rajon ki Baoli is a sight to behold. Said to be built by Daulat Khan in 1516 during the reign of Sikander Lodi, the baoli is named not after the ‘rajon’ or kings but after the ‘rajbirs’ or the ‘mistris’ (masons) who often used the structure. Slippery steps of the large rectangular baoli, or stepwell, lead to the water – in fact it’s a stagnant cocktail full of plastic bottles, bags and algae – three storeys below the ground level. There is a row of arched stone niches on the top floor of the baoli. Wild plants sprout from the crevices, giving life to the otherwise centuries-old dead structure. Inside the niches are big chambers which may have served as cool resting places for travellers of those times. Now, these historic walls bear etchings of the testimonies of newfound lovers. Small alcoves in the walls (probably meant to keep earthen lamps or lanterns) suggest that the stepwell was also a place for social gatherings, even at night. Today, only pigeons perch on them, frequently fluttering from one recess to another, interrupting the silence. A narrow winding staircase, reeking of bird droppings, leads to the roof. Apart from offering a breath-taking view of the ancient structure, the roof serves as a resting place for stray dogs looking for a peaceful sleep under the shade of the trees. From the roof, one can spot a well at the back of the baoli, well guarded by iron bars and filled with dirt, muck and hardly any water. A hop on the adjoining terrace leads to a mosque and a tomb. An unmarked grave rests under the 12-pillared canopy with a few pieces of blue stones (most of the semi-precious stones have been scraped out). A young lad, not more than 25, is sitting near the grave with headphones on. Two cigarettes and a notebook are neatly placed besides him. “It’s much more peaceful here,” he says as I look at him. He often visits the place to escape the city madness. Peace, solitude and isolation are all that is left in this baoli and many others in Delhi. In the Medieval period, baolis were used to store rainwater. They served as a dependable source of water for the nearby population during the dry seasons. But slowly urbanisation crept in and these water storehouses were encroached upon. Many were demolished to accommodate the growing population and several were turned into dumping grounds. “Lal Qila has the biggest baoli in Delhi which dried up because of the metro tunnel construction. There was an underground stream which stopped overnight,” says historian and activist Sohail Hashmi. While some baolis are hiding beneath the surface of the earth, many have just disappeared. The remaining few are being looked after by the government or NGOs. Heritage activist Vikramjit Singh Rooprai says that 25 baolis were counted in 1905. Over time, their condition has only deteriorated. According to the Delhi government website, the Archaeological Survey of India (ASI) takes care of 15 stepwells in Delhi. These include prominent ones like Ugrasen ki Baoli (also known as Agrasen ki Baoli) and Rajon ki Baoli. Imagine! From 800 to 15! 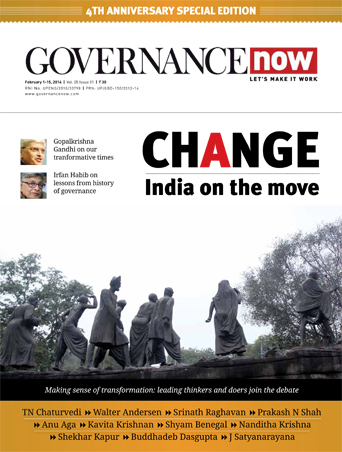 Governance Now filed an RTI query with the ASI on May 29 to inquire about the number of baolis in the city and steps being taken for their restoration. It has been over two months and no response has been received so far. The appeal is still ‘pending’, according to the RTI website. The ASI list doesn’t mention many baolis, such as the Loharheri Baoli in Dwarka, which was discovered in 2010. The restoration work of this baoli has been undertaken by the Delhi state archaeological department and the Delhi chapter of the Indian National Trust for Art and Cultural Heritage (INTACH). In such a scenario, it is difficult to ascertain the exact number of stepwells in the city. “ASI has a separate list. Municipal corporations have a different list. So there is no clear number,” says Swapna Liddle, historian and co-convenor, INTACH, Delhi chapter. ASI protects only those monuments which are of national importance, says Hashmi. “And the criteria for determining such buildings were set by the British. ASI protects about 200 monuments in Delhi. The state archaeology department protects 20, after that it is the responsibility of Delhi municipal corporations and the Delhi cantonment board,” he adds. “It all depends upon who owns the structure, protects it and manages it. There are different boards and bodies associated with different structures,” says Liddle. The multiplicity of authorities and their apathy makes the process of restoration and protection of monuments, including stepwells, an uphill task. Every year, with temperatures soaring during the summers, many parts of Delhi face acute water shortage. Water conservationists believe that revival of water bodies like baolis can help quench the capital’s thirst. According to a report published in the DNA newspaper, the 800-year-old Qutub Baoli inside the Sufi shrine of Bakhtiyar Kaki in Mehrauli can store about 5,500 kilolitres of water. The baoli in the Sufi shrine of Nizamuddin Basti still has an active underground water spring. “The one in Matia Mahal has potable water. People pump it out and supply it in that area,” says Hashmi. Therefore, reviving these ancient water bodies can certainly reduce the water stress, but considering the city’s increasing population, the revival of even a few hundred baolis may not serve the purpose. “When these baolis were established, each would cater to the population of a village. Now there are multi-storeyed structures and it cannot fulfil their water needs. If we start pumping out water then they will dry up in two days,” adds Hashmi. Agrees Liddle: “Water will come in the baolis only if the water situation of Delhi improves.” Water can seep into stepwells only when the ground water level of the city increases. But this doesn’t mean that revival and restoration is not important – or impossible. These stepwells can fulfil another important role. They can collect rainwater and replenish fast depleting groundwater. “The rainwater can be channelled into the stepwell. Then it will become a source of replenishing the sub-soil water, instead of taking out water from it. The water in baolis is anyway not fit for use,” says Hashmi. The ASI for quite some time has been working on a project to revive baolis in the city. The Agrasen ki Baoli, Rajon ki Baoli and Gandhak ki Baoli are a few which have been restored. 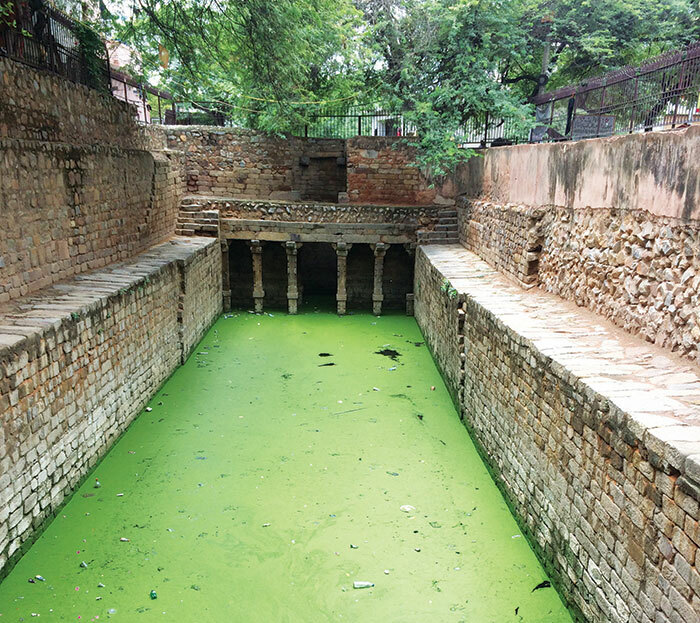 In January, the Delhi Jal Board (DJB) identified 15 baolis for restoration. The then water minister Kapil Mishra had claimed to prepare a “final action plan” to revive the city’s baolis within a month’s time. In fact, the Delhi assembly’s 2017 calendar celebrates the history of baolis in the city. Vikramjit Singh Rooprai contributed pictures for the calendar. But soon Mishra was removed as minister by Kejriwal after a high-voltage drama, putting the issue of baolis on the back burner. Hashmi feels that the central government is not serious about restoring monuments. “In 2012, around Rs 12 crore was given to ASI in Delhi for this purpose. This year, only Rs 5 crore has been given, of which Rs 3 crore has been taken back. 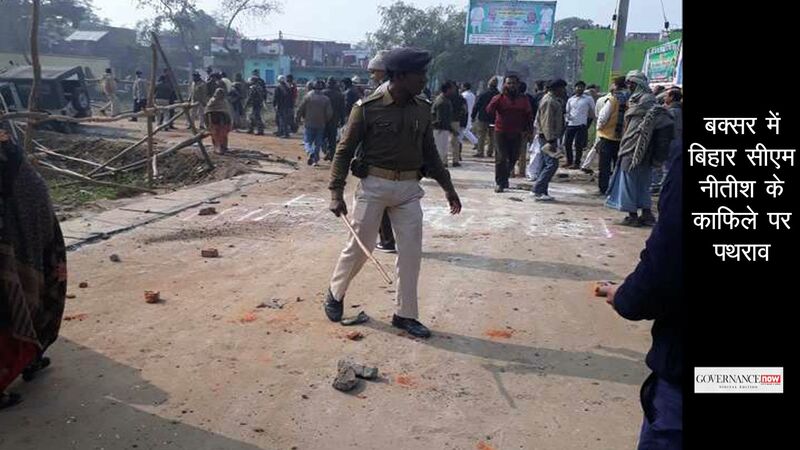 They [the central government] simply say that they don’t want to waste money on these khandahars [ruins],” he says. Moreover, repairing and restoring these ancient structures doesn’t necessarily mean their revival. There is a difference between restoration and revival of a baoli. Explains Liddle, “Restoration means repairing and building the infrastructure – putting the brick and mortar structure in place. Reviving, on the other hand, means revival of water in the baoli and maintaining it. For reviving a baoli you have to assess the groundwater level and then revive it.” After that, the baoli has to be maintained regularly so that the water remains clean. Gandhak ki Baoli is a case in point here. Some 200 metres from the Rajon ki Baoli, in the congested lanes of Mehrauli, is Gandhak ki Baoli – one of the oldest surviving stepwells of Delhi, built by Iltutmish during 1211-36. Unlike the former picturesque baoli, this one can be easily missed by a passer-by. Against the boundary wall of the baoli, makeshift shops of paanwalas and mechanics have come up. Several jhuggis can be seen next to the wall. People throng at a dhaba – probably more famous than the baoli – located just opposite the ancient structure. A tattered ASI board tries to remind them of the presence of the 13th century stepwell. A strong, nauseating smell greets me as I enter through the small gate to the baoli. Legend has it that the baoli derived its name from the sulphur (gandhak) in its water, giving it medicinal properties, useful mainly against minor fungal infections of the skin. But now, it is difficult to tell whether the source of this smell is the sulphur or the litter all around. Without much elaborate masonry work, the baoli descends five levels below the ground. Restored by the ASI, the lower four levels are filled with water. But a thin layer of green algae and some plastic bottles here and there obstruct the vision. Some torn clothes and garbage are heaped on one side of the stepwell. The baoli is enclosed by four-five storey buildings, offering a swimming pool-like view to its residents. As per the ASI board outside, construction within 100 metres of the monument is not permitted, but newly constructed buildings can be seen in the surroundings. Blame it on people’s apathy or government inaction; baolis are fast disappearing from the city’s landscape. 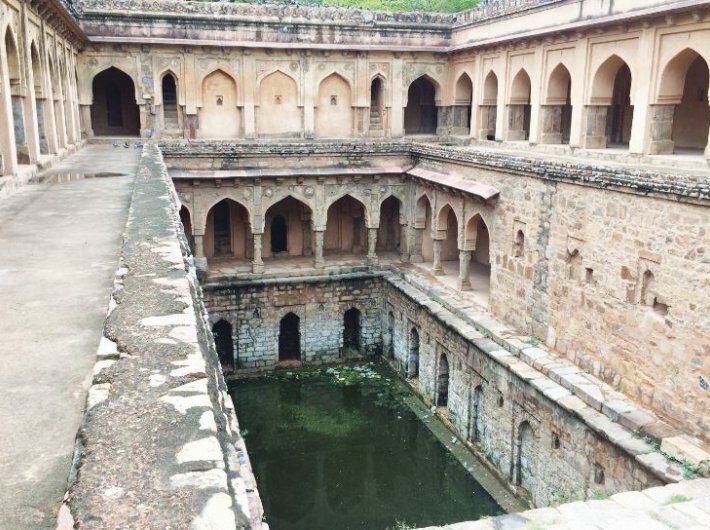 What is needed is awareness among people about the significance of these stepwells – both in terms of its heritage and its water conservation purpose. “A dead man in a grave cannot cast his vote. So he is not important for a politician. Unless that dead man or building becomes important for an average citizen, the politicians will not care about it. So the solution starts from us and not from the parliament,” says Rooprai. Also, some activists feel that blaming the government for everything wrong is not right. “The state department has been helpful and is supportive of conservation of monuments including baolis in Delhi. A few years back we did not even have heritage laws. Now we have them,” says Liddle.